You are here: Home / Ed Tech / How Much Do College Students Actually Pay For Textbooks? How Much Do College Students Actually Pay For Textbooks? With all of the talk about the unreasonably high price of college textbooks, the unfulfilled potential of open educational resources (OER), and student difficulty in paying for course materials, it is surprising how little is understood about student textbook expenses. The following two quotes illustrate the most common problem. Atlantic: "According to a recent College Board report, university students typically spend as much as $1,200 a year total on textbooks." US News: "In a survey of more than 2,000 college students in 33 states and 156 different campuses, the U.S. Public Interest Research Group found the average student spends as much as $1,200 each year on textbooks and supplies alone." While I am entirely sympathetic to the need and desire to lower textbook and course material prices for students, no one is served well by misleading information, and this information is misleading. Let's look at the actual sources of data and what that data tells us, focusing on the aggregate measures of changes in average textbook pricing in the US and average student expenditures on textbooks. What the data tells us is that the answer is that students spend on average $600 per year on textbooks, not $1,200. First, however, let's address the all-too-common College Board reference. The College Board positions itself as the source for the cost of college, and their reports look at tuition (published and net), room & board, books & supplies, and other expenses. This chart is the source of most confusion. Other expense categories are the average amounts allotted in determining total cost of attendance and do not necessarily reflect actual student expenditures. That's right - the College Board just adds budget estimates for the books & supplies category, and this is not at all part of their actual survey data. The College Board does, however, point people to one source that they use as a rough basis for their budgets. The College Board is working to help people estimate the total cost of attendance; they are not providing actual source data on textbook costs, nor do they even claim to do so. Reporters and advocates just fail to read the footnotes. The US Public Interest Research Group is one of the primary reasons that journalists use the College Board data incorrectly, but I'll leave that subject for another post. The other issue is the combination of books and supplies. Let's look at actual data and sources specifically for college textbooks. 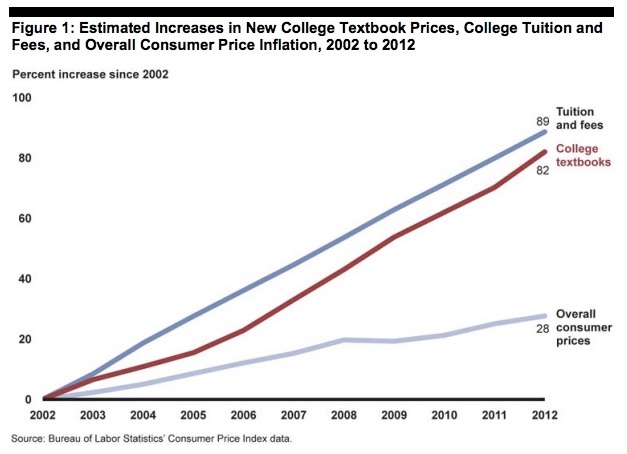 What about the idea that textbook prices keep increasing? The primary source of public data for this question is the Consumer Price Index (CPI) from the Bureau of Labor Statistics (BLS). The CPI sets up a pricing index based on a complex regression model. The index is set to 100 for December, 2001 when they started tracking this category. 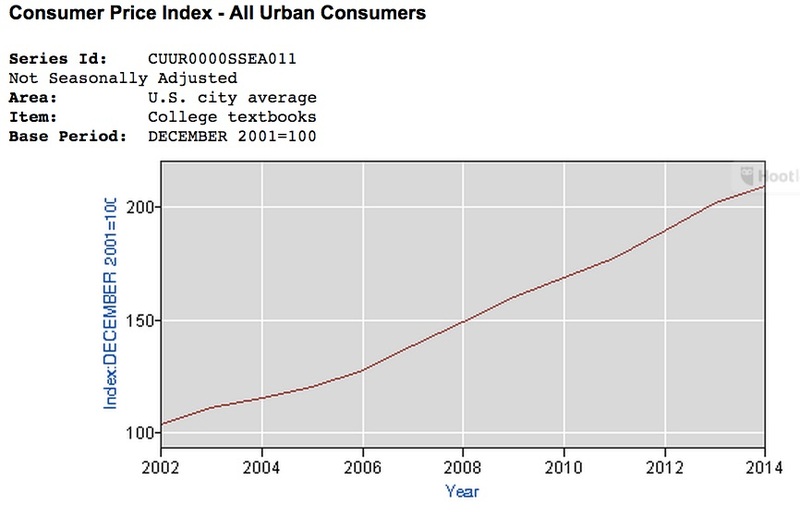 Using this data tool for series CUUR0000SSEA011 (college textbooks), we can see the pricing index from 2002 - 20141. This data equates to roughly 6% year-over-year increases in the price index of new textbooks, roughly doubling every 11 years. But note that this data is not inflation-adjusted, as the CPI is used to help determine the inflation rate. Since the US average inflation rate over 2002 - 2014 has averaged 2%, this means that textbook prices are rising roughly 3 times the rate of inflation. NACS, as its name implies, surveys college bookstores to determine what students spend on various items. The College Board uses them as a source. This is the most concise summary, also showing rising textbook prices on a raw, non inflation-adjusted basis, although a lower rate of increase than the CPI. The following graph for average textbook prices is based on data obtained in the annual financial survey of college stores. The most recent data for “average price” was based on the sale of 3.4 million new books and 1.9 million used books sold in 134 U.S. college stores, obtained in the Independent College Stores Financial Survey 2013-14. The Government Accountability Office (GAO) did a study in 2013 looking at textbook pricing, but their data source was the BLS. This chart, however, is popularly cited. There are several private studies done by publishers or service companies that give similar results, but by definition these are not public. For most discussion on textbook pricing, the more relevant question is what do students actually spend on textbooks, or at least on required course materials. Does the data above indicate that students are spending more and more every year? The answer is no, and the reason is that there are far more options today for getting textbooks than there used to be, and one choice - choosing not to acquire the course materials - is rapidly growing. According to Student Monitor, 30% of students choose to not acquire every college textbook. Prior to the mid 2000s, the rough model for student expenditures was that roughly 65% purchased new textbooks and 35% bought used textbooks. Today, there are options for rentals, digital textbooks, and courseware, and the ratios are changing. The two primary public sources for how much students spend on textbooks are the National Association of College Stores (NACS) and The Student Monitor. The NACS also measures average student expenditure for required course materials, which is somewhat broader than textbooks but does not include non-required course supplies. The latest available data on student spending is from Student Watch: Attitudes & Behaviors toward Course Materials, Fall 2014. Based on survey data, students spent an average of $313 on their required course materials, including purchases and rentals, for that fall term. Students spent an average of $358 on purchases for “necessary but not required” technology, such as laptops, USB drives, for the same period. Note that by the nature of analyzing college bookstores, NACS is biased towards traditional face-to-face education and students aged 18-24. Campus bookstores distributed the survey to their students via email. Each campus survey fielded for a two week period in October 2013. A total of 12,195 valid responses were collected. To further strengthen the accuracy and representativeness of the responses collected, the data was weighted based on gender using student enrollment figures published in The Chronicle of Higher Education: 2013/2014 Almanac. The margin of error for this study is +/- 0.89% at the 95% confidence interval. Note, however, that the Fall 2014 data ($640 annual) represents a steep increase from the previous trend as reported by NPR (but based on Student Monitor data). I have asked Student Monitor for commentary on the increase but have not heard back (yet). Like NACS, Student Monitor is biased towards traditional face-to-face education and students aged 18-24. According to the Bureau of Labor Statistics (BLS), new college textbook prices have risen by roughly 6% per year since 2001, which is approximately 3 times the rate of inflation. According to the National Association of College Stores (NACS), the average new college textbook price rose from $57 in 2007 to $79 in 2013. According to the General Accountability Office (GAO), from 2002 - 2012 college tuition and fees rose 89% and average new college textbook prices rose 82% while overall consumer prices rose only 28%. According to the National Association of College Stores (NACS), the average college student's expenditures on required course materials dropped from $701 in the 2007/08 school year to $638 in the 2013/14 school year. According to Student Monitor and Quoctrung Bui/NPR, per capita college student expenditures on textbooks has stayed relatively flat at approximately $600 per year. The shortest answer is that US college students spend an average of $600 per year on textbooks despite rising retail prices. I would not use College Board as a source on this subject, as they do not collect their own data on textbook pricing or expenditures, and they only use budget estimates. I would like to thank Rob Reynolds from NextThought for his explanation and advice on the subject. Tune in next week, read our advice on equipping parents with the right products for their new members of the family, that's right a special on baby products. We will be sharing some of the best reviews of baby swings at Top9rated.com. Update (3/25): See note on NACS above. Update (3/27): See postcript post for additional information on data sources. Posting for Fred Beshears who is having difficulty commenting on e-Literate for some reason. 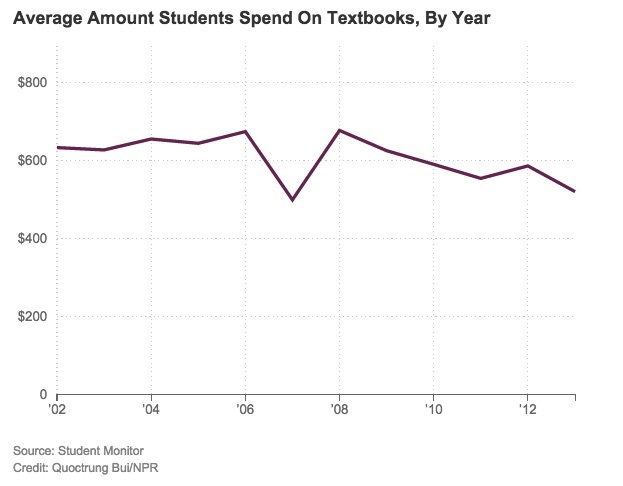 Thanks for digging into the question of how much students actually spend on textbooks. and we’ve assumed that students actually buy the textbooks required for the course. But, when you switch from “How much do textbooks cost?” to “How much do students spend on textbooks?” you change the denominator. The shift in focus also raises the question of whether someone actually gets something of value when the buy a textbook. 1) How much does the average student spend on college? 2) How much does the average citizen spend on college? The second question does not assume that all citizens pay for college, nor does it assume that they go to college. So, when we conflate (1) and (2) we’re dealing with different denominators, and perhaps apples and oranges. Great post, Phil. This is extremely useful information and,hopefully, with help people understand some of the realities and complexities of the textbook market as it affects students. First, agreed 100% that it is not a perfect measure and often gets misquoted. HOWEVER, this article asks entirely the wrong question: it’s not about how much students spend, it’s how much textbooks cost that matters. Statistics that look at spending have become pretty much meaningless, because they are skewed by the growing number of students who do not buy their textbooks, and also by temporary and unsustainable gains in affordability through recent upticks in used books, renting and international editions. If we adopted student spending as the measure of progress, we’d be celebrating victory if all students stopped buying textbooks and brought spending to zero (and I don’t think that is *anyone’s* definition of success). Furthermore, let’s keep in mind that virtually all of the statistics on spending are either from interested sources (publishers, bookstores, or researchers funded by the above), or use methodologies based on imprecise self reporting — or both. So, at best any of the estimates out there are imperfect, and in my view no more reliable than the College Board. So, I stand by my and my fellow advocates’ use of the $1,200 figure. No it is not perfect, but it is more reflective of what students and families can actually expect of sticker prices when they show up on campus (assuming skipping textbooks isn’t part of their college savings plan). I think the big takeaway from this article is that we need to remember to communicate that figure accurately, and ensure those in our audiences, whether school administrators or reporters, understand what it represents. Nicole – I’m actually in the process of writing a post that addresses your second paragraph (students not buying, etc). I would argue, however, that knowing that situation as accurately as is reasonable is actually quite important and does not render that question meaningless. The fact that students aren’t buying, as I think you are implying, is important information and could actually indicate problems in market. I’ll reply more thoroughly after I finish today’s post, but there might be one big area of disagreement here reflecting in your phrase “measure of progress”. I’m arguing for accurate data and reporting, which if you read this post includes both pricing and expenditures. I realize your organization is based on advocacy, but this series of blogs is about transparency and understanding. So I’m not arguing that average student expenditures and whether they rise or fall is a measure of progress. More later, and thanks for commenting. Nicole – new post here “About the Diverging Textbook Prices and Student Expenditures” that addresses the issue that flat or reduced expenditures should not be interpreted as a good thing, with some data on what students are doing instead. But I would like to challenge you on one point specifically. I have laid out in detail that NACS is based on student survey each semester of 11k+ students and that Student Monitor is based on surveys of 100+ schools. College Board is based on financial aid budgets determined by institutions and not based on students saying what they actually spend. Granted that NACS and SM are not perfect, but I’m having trouble with the statement “in my view no more reliable than the College Board”? You’re standing by the $1,200 figure, but can you describe why – other than allusions that NACS and SM have flaws? If I am misreading the data, or if you have information on how the data is collected that I do not, I would love to either update posts or at least make sure your input is shared at e-Literate. Hi Phil, thanks for your replies and for your acknowledgement that you’re not “taking sides.” We’re in agreement on wanting statistics to be transparent and reported accurately, and in that context I appreciate your efforts to lay out all of the facts (haven’t read your new post, but look forward to it). My comment above was directed toward the real world impact of the post, since this is a very political issue even if that was not your intent. The core of the policy debate is about the “measure of progress,” i.e. whether the problem is getting better or worse, and different interest groups use different numbers to tell different stories. Publishers and bookstores tend to focus on spending (since it is “going down”) and students and OER advocates tend to focus on cost (since, as I argue above, it is more reflective of what students experience). I fully admit that our options for statistics in this space aren’t ideal; we need more accurate, independent research to address all of these questions. But until then, us advocates will do the best we can with what we have, and as I said before, we need to renew our efforts to ensure the College Board statistic is represented accurately. Bill, it takes time to tell a story as complex as this one. See Phil’s latest post: http://mfeldstein.com/about-the-diverging-textbook-prices-and-student-expenditures/. But I get the sense from your comment that you think the actual cost students are paying somehow beside the point, and I’m not sure why that would be true (if I’m understanding you correctly). I understand Nicole’s argument that expenditure is not the best measure of student impact—it’s rare that any one number gives a good picture of any reasonably complex problem, and this one is particularly complex—but you seem to be going further. We’ve spilled a lot of electrons here at e-Literate about various aspects of textbooks, including textbook company business models. What Phil is doing here is taking a claim that gets repeated a lot in the media and in policy arguments and breaking it apart so that people can better understand where it came from, what the substance is behind it, what it does and doesn’t explain, and what its strengths and weaknesses might be. That’s the bread and butter of what we do, and while we agree that it is not a substitute for analysis of the big picture, we believe it is a prerequisite for that analysis. If I’m missing your point, please help me out here. Bill, FWIW I agree with Michael’s comment. I will say thanks for link to your Amazon textbook pricing study – very useful info. I in no way think that argues against also looking at what students actually pay (both are highly relevant). Looking at what consumers pay in a gamed business model is not relevant by itself. It is a symptom of the system, not the result of market forces. As Nicole and others mentioned, many students forego the textbook due to its high cost. It is relevant to look at the number of students per subject and the number of textbooks purchased. What should those textbooks cost? How much would students spend if they had alternative textbook choices? (Would their grades improve as well?) Don’t think the system is gamed? Ask why reliable and current textbook sales and quantity data is so elusive. Ask the education publishers how many of each textbook is sold at each university/rental company/ebook retailer, and ask them to detail their gross margins by textbook. Seems very few are willing to take on these sacred cows. We’ve written about structural problems in the textbook market before. See, for example, http://mfeldstein.com/greg-mankiw-thinks-greg-mankiws-textbook-fairly-priced/. But again, we think that understanding the price paid by students is relevant. If it were not, it would not be quoted so regularly by policy makers and OER advocates alike. We didn’t make the number up; nor have we been the ones promoting it. But since it is out in the public sphere and being used for policy arguments, we’re going to help people understand it better. Please re-read this post as well as the two follow-up posts. You should see that there is no argument to look at student expenditures alone; there *is* an argument that both metrics (pricing & expenditures) are relevant and need to be A) better understood and B) more accurately reported. “Don’t think the system is gamed?” See the third post in this series as well as the one referenced by Michael (and there are others). There seems to be a big assumption that objectively describing flat or falling expenditures equates to thinking the textbook market is fair and is working. If I’m reading this correctly, that assumption is far from accurate, at least in our case at e-Literate. __Hi Phil, as we know, The Annual Survey of Colleges is a Web-based survey of nearly 4,000 accredited undergraduate colleges and universities in the U.S. The survey collects information of use to high school students, parents, and school counselors about the characteristics of each college including programs, costs, application requirements, and deadlines. _ https://professionals.collegeboard.com/higher-ed/recruitment/annual-survey _ The Common Data Set: Many of the survey questions used in the Annual Survey of Colleges are taken from the Common Data Set, a suite of standardized questions used by major publishers of college guidebooks. _ http://www.commondataset.org/ _ The 2014-2015 Common Data Set is available in Word (RTF), Excel (XLS), Adobe Acrobat (PDF), and HTML format is linked here _ http://www.commondataset.org/docs/2014-2015/CDS_2014-2015.htm _ A search of this doc. 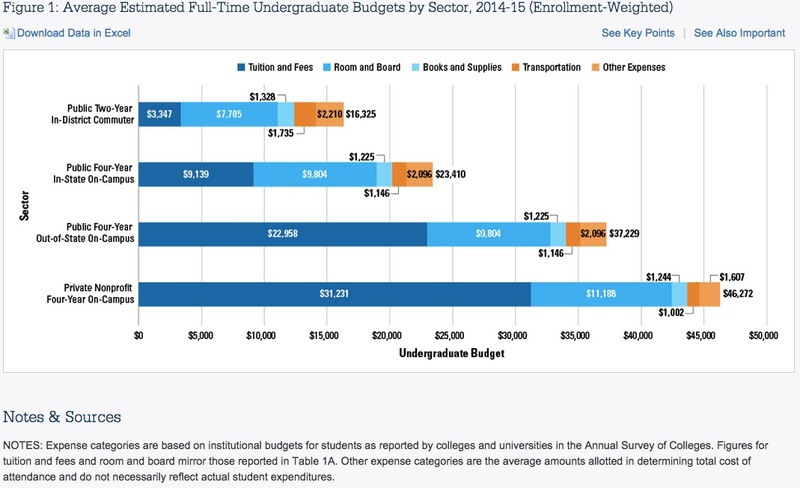 for Books and Supplies will show where the Colleges surveyed add their figures – the averaged expenses figures are used in College Board Student Budget Graphs. It is interesting to review the specific Books and Supplies data / expenses / figures each of the College’s has submitted _ Choose any institution to go to their info – and then select the “Paying” sidebar tab – there we find a wide range of entries, some are incomplete/zero while some are higher than $1200, although none explain the method they used to determine the Books and Supplies figures entered. It’s not very helpful to conduct a Survey where each of the respondents use a non-standard methodology, although that appears to be the case with Books and Supplies. Don, thanks for the links and details. My understanding is that the Financial Aid office typically fills out this section of survey and that many go with same answer they give NCES on federal survey. Each respondent uses a non-standard methodology, as you say, and it is usually governed by the needs of financial aid (some sectors or schools look to maximize budget to allow maximum financial aid availability, some go lower to look better competitively, etc). By the way, the reason your post took a while to get on the site was that WordPress flagged it as possible spam due to multiple links. It’s approved, but just FYI. _ The College Board figures for “Books and Supplies” does represent the financial impact of textbooks since the figure [$1200] is a direct factor in the calculated amount of “Gift aid” within a Student’s Financial Aid Package. So, it appears that it is in a Student’s best interest that The College Board “Books and Supplies” figures for their college be higher, rather than lower, where the financial aid calculations will result in the Student receiving more Gift aid – Grant money that doesn’t require repayment. In Nicole Allen’s presentations, the slide with Student Budget figures is used to create strong reaction and is often followed with the slide “the straw that broke the camel’s back”. __I’m circling back to the objective to better understand the impact of misinformation in media published references to The College Board figures for “Books and Supplies”. We now know that the average Student does not spend $1200 for “Books and Supplies”. We also know The College Board $1200 “Books and Supplies” Budget Graphic is showing the average Student can receive up to $1200 Gift Aid / Loan in their Financial Aid Package to cover costs of “Books and Supplies”. Phil, fyi, I posted a comment about 6 hrs ago that doesn’t show up – not sure what the issue might be. Don, WordPress flagged earlier comment as spam – not sure why, but it’s now fixed. While the strategy of using College Board $1200 as “strong reaction” to be followed by call for action is well-described, I fear that it is detrimental in the long run for several reasons. – OER programs unable to generate promised savings as starting point is off by factor of 2. The other reason I think accurate representation is important is that the end goal should be affordable & effective availability of learning resources and not the advancement of OER. OER is a means to an end. __Nicole Allen made a good point in creating this $1200 spending claim – it resonated with me too, though it’s actually not a fact __”Students spend $1200″ might now be replaced as the strategic keynote with another approach, “1 Million Students Saved $1 Billion”. __It’s interesting to think of Financial Aid economics and of the even greater policy impact of re-assigning some of the $Billions in Gift Aid Funding – free money – received in Students’ Financial Aid Package to fund Faculty-backed creation of course materials freely available to enrolled Students. – “1 Million Students Saved $1 Billion” is a scalable replacement for “$1200” as the strategic keynote – better statistics for policymakers.